The Star Cars Birmingham taxi app has revolutionised the way you book, and now track your Private Hire vehicle in Birmingham. Every hour of every day you’ll jump the queues on the phones to access our Premier Birmingham Fleet via our new taxi booking app. More than 2 million passengers a year use our service, and our average response time is just 7 minutes! The best thing about our Birmingham Taxi App, however, is your ability to track the vehicle you’ve booked on the integrated map. With our additional and FREE text alert feature, you will also be able to know exactly what vehicle you’re getting into! Essential to avoid getting into unlicensed and uninsured vehicles! Simplicity is the hallmark of this innovative, user-friendly taxi booking solution, giving you access to our fleet of over 200 licensed vehicles. A few taps on your phone is all it takes to book with us, avoiding the need to call and long queues on the phones at peak times. Automatic detection of your location via GPS and maps. 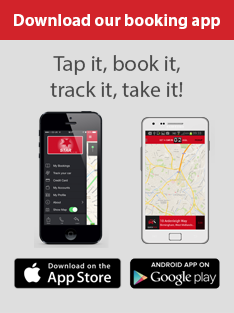 This App has been designed to be used for journeys within a 40-mile radius of Central Birmingham. Why not download the Birmingham Taxi app now? Please note that we cannot respond to reviews and feedback here, but please feel free to contact us on info@starcarsbirmingham.com. We’d love to hear from you!